Sweet and sticky. 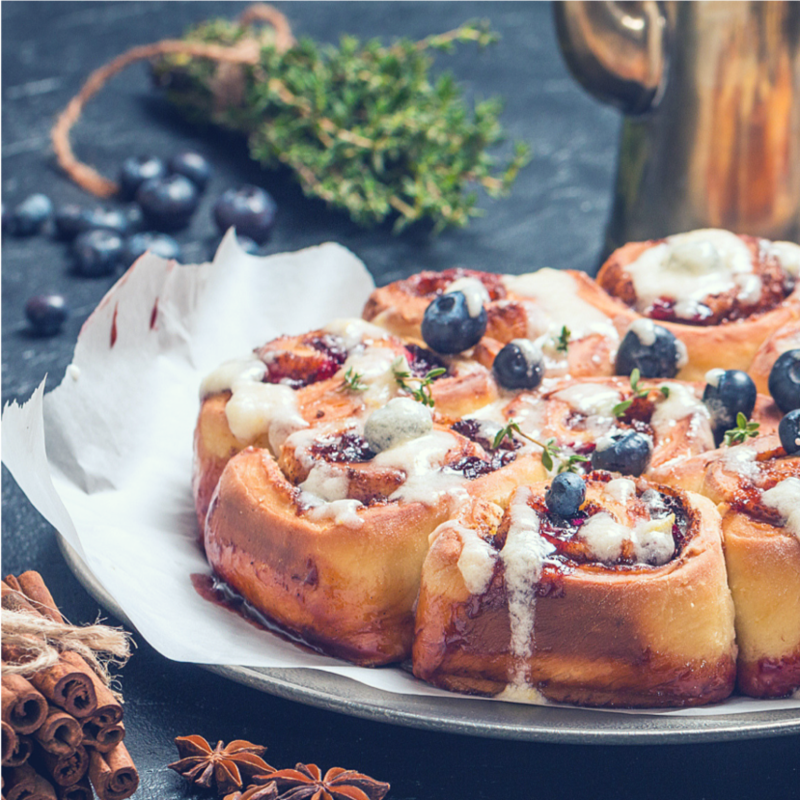 This blueberry cinnamon swirl recipe tastes amazing! For the dough, mix the flour, sugar, yeast, salt and vanilla. Melt the butter (in the microwave). If the milk and eggs are not at room temperature but from the fridge, put the milk in a jar, add the egg yolks and warm it up in the microwave. Add the milk-eggs-mixture and the melted butter to the flour mixture and knead with a food processor until the dough gets very smooth and shiny. Cover the bowl with a tea towel and leave to rest in a warm place for about an hour. Melt the 2 tablespoons of butter in the microwave, add the sugar and cinnamon and mix well. Roll out the dough to a size of about 30 by 20cm and spread the melted butter-sugar-cinnamon mixture on the dough. Sprinkle with the blueberries and roll it up. (Start rolling up the longer side of the rectangle.) Cut slices of about 3-4 cm and put them into a buttered and floured baking tin. Make sure that the individual rolls are not too close to each other, as they will rise in volume while baking. Leave to rest for about 30 minutes. Make an egg wash with one egg yolk and 1 tablespoon of milk and coat the rolls. Bake in a preheated oven (160°C) for about 40 minutes. If you want, you can spread some icing on top once they have cooled. For the cream cheese icing mix the ingredients for the icing until you get a soft and smooth cream and spread it on the cold cinnamon rolls.